Bass fishing is fair. Use the Carolina rig with a Zoom lizard in green pumpkin on the main lake ledges. The fish have moved out to the river channel ledges and to grass points in the creeks. Crank baits are slow lake wide. Almost all the fish are taking plastics but try a white buzz bait any time of the day. Jigs are also fair up the rivers in all brown. Plastic or pork trailer will work and match the trailers to the bait. Soft plastics in the green pumpkin, green shad or red bug are working mid day till dark. A grass rat on the edges has been working when the sun is straight up. Work the bait just like a Zara Spook and walk the baits on the edges with an extra rattle in the bait. Bass fishing is fair still slow. The rain has stopped for now and the daytime temperatures are rising into the low 90’s every day. The Rapala #5 Shad Raps is catching a bunch of small bass lake wide. Fish the smaller cuts and coves. Fish both the Balsa Wood and RS Models early in the morning and then again late in the day. The shad color seems to be working the best with the clear green water. After the sun comes up, finesse worms and trick worms on any wood or rocky points are working on a few bass as well. Use the Carolina rigs in deep water during the late morning until afternoon on the drop offs and channel ledges. Spend a little time looking at the points and underwater islands with the Lowrance Structure Scan and Down Scan technology to find baitfish in these area before fishing. This will help narrow down where the fish are. Submerged structure in 18 to 25 feet of water seems to be the key. Water Level is down 7.68 feet below full pool. Most areas of the main lake are clear and with the recent rain the Tugaloo side from Gum Branch and above are stained. The water temperatures are 64-68 in the Tugaloo side of the lake. Look for this and the main lake to be the same with the cold spell we had the last couple of days. This will improve the bite believe it or not and will help put both the bait and the fish in their key fall areas. We are going to continue to focus shallow in the Tugaloo river areas as the temperatures continue to get cooler. We have been working both short and long pockets for these fish. The key has been the bait we will idle in and look on our side imaging and 2D sonar if we found bait we would fish the area if not we moved on to the next pocket. Our key baits have been a buzz bait, chatter bait, swim jig, and flipping jig. The other key to this was to only fish the high percentage areas in the pockets. Look for underwater flat points, flats, docks, and brush and be versatile at all times. If we saw any of these key areas we fished them with one of the above mentioned baits. You will want to cover as much water as you can so keep the trolling motor on high hit the high percentage structure and cover and keep moving. Remember this time of year is all about the bait find it and you are more than likely going to find the fish. The lake is still low and there are a lot of objects sticking up out of the water and not marked so be safe out there and we hope to see you on the water. If you want to see some of the fish we have been catching follow me on my Facebook fishing page at https://www.facebook.com/Josh Panyard Fishing. 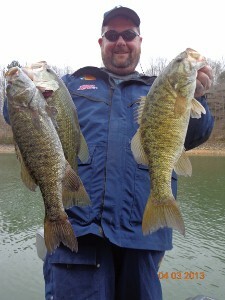 This entry was posted in Fishing Reports, Where To Fish on March 22, 2016 by ronniegarrison. 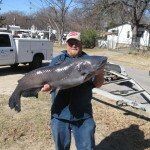 Hey guys and gals, Jason Barber here with the www.kingscreekadventures.com fishing and lake report for Cedar Creek Lake.The lake level is at 4.90′ low and the water temperature is in the high 40’s to low 50’s give or take a few degrees. The water clarity ranges from stained to very stained heading north. The Hybrids and Sandies are still deep and the best way to get a bite is still in deep water. The dead stick bite is a great way to catch good fish both hybrids and white bass alike. Try small shad imitations from crappie sized to 4″ and many colors will work. Stay in 30 to 50′ of water and drop the bait down to the bottom and fish 1 to 10′ up from the bottom. Try banging, bumping, stomping or kicking the boat floor for some extra attention from the fish “and anyone else close by” and this will simulate lots of birds feeding on schools of shad and attract the predator fish. The crappie are moving shallow but the inconsistent weather will keep the bite hit and miss for a little longer. Some fish are being caught in 3 to 6′ of water inside the marinas and a few fish have been caught way up in the creeks as well. With all that being said it’s time to start keeping tabs on a shallower bite for the beloved crappie. Don’t totally overlook the staging areas where they stack up heading to spawn, these are great areas to find large schools and get multiple bites. The Catfish are available in the entire lake right now. You can choose to drift in deeper water throughout the lower end of the lake or fish the shallow north end of the lake in 2 to 10′ for great action bottom fishing. Either way you decide to go you will need fresh cut fish for bait, try shad, drum, carp or bream for the most part. As for the large mouth, try sneaking into spawning coves and fishing down the shoreline throwing a chatter bait or spinner bait to cover water. I always have a jig or smaller plastic worm or creature bait ready to pick apart any good looking cover you may find or a deeper dock that has 2 to possibly 10′ of water on it “of which the latter are hard to find” this will get you some extra bites and probably your best ones. Thanks as always for your time and support, if I can answer any questions about the lake or the fishing here on Cedar Creek Lake please contact me. If you would like to book a fishing trip I’d be happy to accommodate. You can reach me at 903 603 2047 or 903 887 7896 . 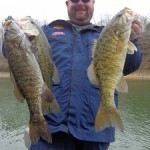 This entry was posted in Fishing Reports on February 17, 2015 by ronniegarrison. Line side fishing is very good. We have been catching stripers up to 24 pounds and hybrids weighing close to 13 pounds this past month. Down lining shad at 30 to 50 feet has been our best over all bite. The mouth of most of the major creeks on the south end of the lake are holding stripers. And the backs of the Creeks, main lake points and humps are holding the Hybrids. Fresh bait is the key to catching line sides on Carter. Be sure to carry plenty of bait. We are also catching a few fish on lead core. I am running a 2 ounce jig with a white trailer and 7 to 9 colors depending on the day at 2.9 miles and hour. Anglers, we have a book on BASS FISHING LAKE ALLATOONA that has GPS 50 coordinates also. Ask for samples of the book and the coordinates from ken@southernfishing.com Try these two N 34 10 846 W 84 43 128 Good spawning pockets in McCaskey Creek. Use Sammy 100 and Big swim baits around the schooling fish. N 34 10 294 W 84 43 092 Good spawning area around Bartow County ramp with a Sammy 100 and big swim bait area. Ken Sturdivant, Lowrance Pro Staff, will be at Dreher Island State Park, 3677 State Park Road, Prosperity South Carolina 29127, August 13 through 17, 2014. Ken will doing Lowrance demonstration rides from 8am until 2pm Thursday, Friday Saturday and Sunday at the park. 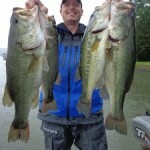 This entry was posted in Bass Fishing, Fishing Reports on August 1, 2014 by ronniegarrison. For all the fly fisher globetrotters is a quest every year to choose the right place and the exact moment. We are always looking for tides, moon phases, fish run and operations that can meet the expectation of a highly anticipated week, that we could schedule between family holidays, birthdays and others obligations. 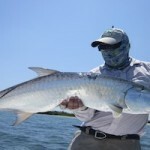 Finally we have the clue between high-end exclusive services and tarpon fishing that can blow your head off. During the last week of April and the first days of May 2014 we booked the very first operation week with fishermen of the impressive Avalon 2 Yacht, that fish out from Jucaro Port, 350 miles south from Habana in Cuba to Gardens of the Queen. There, you’ll find a live aboard where you could stay days, weeks or months, with all the ammenities you could imagine, from the skyline jacuzzi in the last floor to the freestyle slide of the second floor. So, having the right place to stay inside an amazing marine park like Gardens of the Queen, we only have to peak the fishing zone of the area and the season. After been working for several years at Cuba, we heard about the new fishing area at the end of the Gardens, near fifty marine miles south from Tortuga, yes sir, that far south. The Gardens are huge and you could fish a month without repeat the same area. Just two years ago they start fishing this southernmost point, where the tarpon run appears during the first full moon of April in an amazing run of “sabalos”, if you have already fished “boca grande” in the Gardens, this is even better, so well, just imagine. Been there, I can only say that this is one of the few places left in the world where you could fish schools of tarpon from one or two to hundreds of them, in sizes from 20 pounds to over 120 pounds and it is not uncommon to see female tarpons with ten males around her daisy chain, in strings or just moving in a spawning ritual. Just 1 mile away from these channels flats, you have runs of big size tarpon rolling just like Holbox and also other places in deep waters, but that´s another story. Just to give you a “screenshot”, one day our 5 skiffs where “in line” waiting for the daily “run”, moment after a big string of more that 60 tarpon roll in front of us, right away we were all jumping or hooking on tarpons, it was really awesome and I couldn’t believe it. 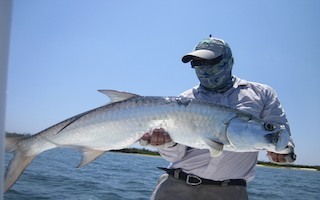 You could see long strings at other locations but this tarpon eat flies with madness, in the same cast you could jump two or three tarpons just keep retrieving the line and you will see. Like you know, our agency is based in Santiago de Chile, so we can say with total confidence, that this are our home waters. If we constructed a worldwide network of the best destinations for travel and angling round the globe, imagine what to expect from our Country. So, if your looking for your next Patagonian Retreat, please drop us line. We´ll be here waiting for you with Pisco Sour and Chilean wine, once you arrive. 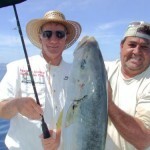 This entry was posted in Fishing Reports, Saltwater Fishing on May 22, 2014 by ronniegarrison. 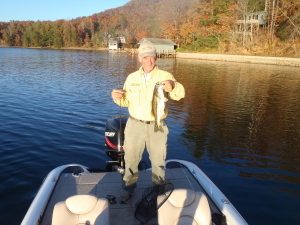 Lake Guntersville Forecast – What a turn around on Guntersville; so far this spring the Mighty “G” really shined for all levels of anglers. I look for May to be no different than March and April. With fish in post and pre-spawn patterns and the famed arrival of the shad spawn during the second and third weeks for the month. Over the past month we found our fish in 1 to 25 foot of water on a combination of baits, ranging from Assassinator Buzz Baits, Rattle Baits, Swim Baits, Rapala DT-6, 10, 16 crankbaits, Tightline football head jigs with Missile Baits trailers to single swim baits and Missile baits D-Bombs. May will bring us a terrific spinner bait and top water bite, look for pop-r’s, spooks, Sammy’s and buzz baits to be the talk of the lake. 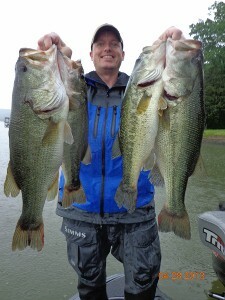 Anglers should not forget the deep crank bait bite; Guntersville has a history of producing huge sacks of fish in May when angler employ deep diving crank baits such as Rapala DT 16 or DT 20 crankbaits on drops and channel grass. Water temperatures range between 66 to 72 degrees. Now is the time to plan your late spring trip to Guntersville, call me to reserve a date; May will bring the shad spawn and a great top water season. The ledge bite will start in late May and early June. WINDS LAY DOWN AND BEST YELLOWTAIL BITE OF SEASON GOES OFF! The winds started laying down early in the week and got better from there. 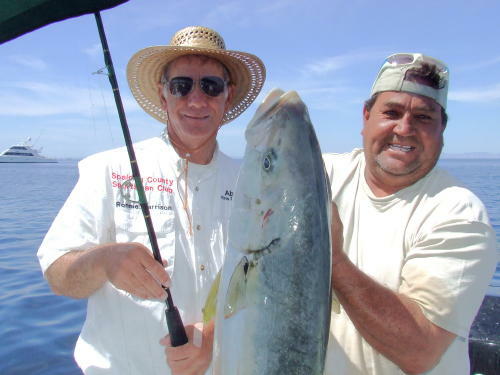 By the time mid-week hit, the best yellowtail bite of the season kicked in with as many fish lost as being caught and anglers canceling boats because they caught “too many fish!” Got lots of great photos this week and all the details! 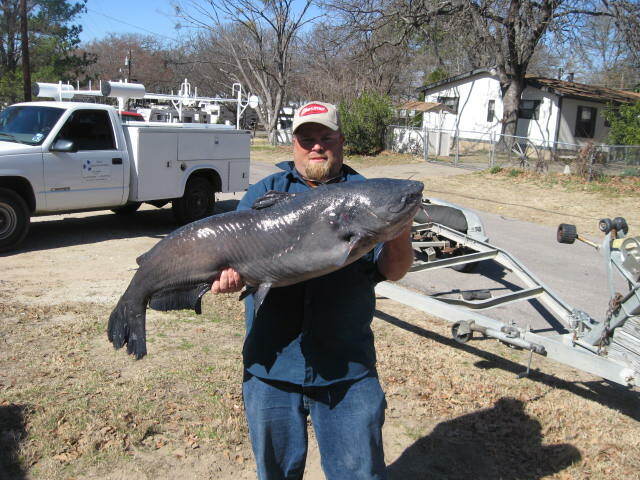 This entry was posted in Fishing Reports on April 5, 2013 by ronniegarrison.